We are proud that our home city of Plymouth was the first Social Enterprise City in the UK and equally proud of our role in securing and developing this concept. The EU is funding Iridescent Ideas CIC to deliver business advice to existing social enterprises and start-ups in Devon and Somerset. The programme is called Enhance Social Enterprise. More information about Enhance can be found here… We want to commission a suitably qualified freelance business adviser to help deliver this project with us between April and September 2019. Please download the brief below and follow the instructions. Iridescent Ideas has been delivering a range of activities as part of the Rise funding in Plymouth. We have recently delivered two online webinar which went live on Facebook and can be watched here. The award winning, Cornish, employee owned social enterprise, Smile Together CIC, has just published its latest social impact report. Click here to download a copy. Iridescent Ideas helped to develop the social impact concept behind this report. We worked with marketing agency Fuel Communications and the Smile Together team to come up with the Prevent, Reach, Treat impact strategy and the outcomes measurement and management concept to help prove that Smile Together is making a big difference. 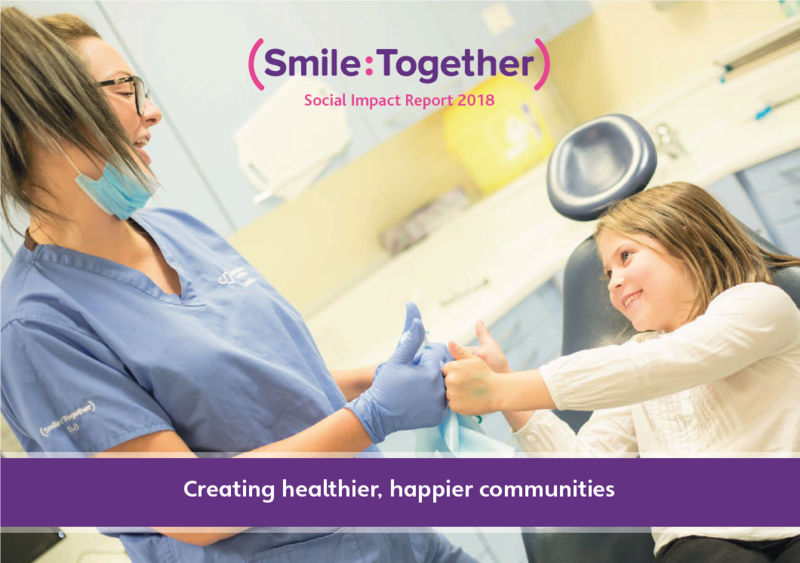 Paul Critchley, Managing Director of Smile Together, said: “Smile Together would like to thank the Iridescent Ideas team for providing support and guidance in producing our annual Social Impact report. Gareth Hart, Director of Iridescent Ideas CIC, said: “Smile Together is a brilliant social enterprise and asked for our help proving the impact of their work. “They had lots of great statistics and data and needed to go further to show the qualitative impact they had had. “In consultation with the organization we developed the impact concept that helped them fit their activities to the needs in the community. “Fuel Communications then provided the design and words to help bring the report to life. Smile Together were recently ‘highly commended’ at the national SEUK social enterprise awards as one of the best health and social care social enterprises in the country. Get on touch with us at gareth@iridescentideas.com if you want to talk about your social impact work and see how we can help. We are very excited to be a part of The Rank Foundation’s Plymouth Rise Programme. This £1.5 million scheme aims to promote social enterprise and inclusive growth in Plymouth. The Rank Foundation is funding Iridescent Ideas to provide thought leadership, business advice and information to support the social enterprise economy in the city. We will also be encouraging greater networking across social entrepreneurs. We will also be releasing a number of short films and blogs that all relate to social enterprise. Our director, Gareth Hart, recently spoke at the national Lithuanian social enterprise conference: Socialinis verslas. The summit was attended by the Lithuanian Minister for Agriculture and the Vice Minister for Social Affairs along with senior representatives of other government departments and from the social enterprise community. June was a fun month, we met a lot of interesting people looking to do great things in the world and attended a number of fantastic events.